The McDonnell F3H Demon was a US Navy carrier-based jet fighter aircraft. The successor to the F2H Banshee, after initial problems, it served from 1956 until 1964. Development work began in 1949, the aircraft was designed around only a single Westinghouse Electric Corporation J-40 engine, which was to have over 11,000 lb of thrust - three times that of the engines in the Banshee. It was the first swept-wing design produced by McDonnell and among the first US aircraft to have missile armament. The prototype first flew in 1951 and first test flights of the operational design were in January 1953. The engine was a major disappointment, producing only half of the expected power it was temperamental and unreliable, of 35 F3H-1 aircraft that were flown with the J-40 engine eight were involved in major accidents. The J-40 engined aircraft were grounded and a new engine was sought. (In fact, brand new J-40 powered Demons were barged or trucked directly to training schools and never flown, starting an investigation into fraud by members of Congress. Things never change.) The best alternative was destined for the F-100 Super Sabre and subsequent F3Hs were fitted with the Allison J-71 engine (also used in the B-66) and designated the F3H-2. While more reliable this new engine had to be 'shoe-horned' into the airframe and with less power than needed did little for the aircraft's performance. The first Demon with a J-71 flew in October 1954. Another problem was with the ejector seats, initial versions could fail to operate and had to be replaced with Martin Baker models. Despite the problems in 1956 the Navy ordered 239 F3H-2s and the first were deployed in March 1956. 522 Demons of all versions were built up to the end of production in November 1959. It was the Navy's first all-weather interceptor with radar and the Raytheon Sparrow or Sidewinder AAM and remained the Navy's front-line fighter until 1962 when it was succeeded by the F-4 Phantom II. Although developed during the Korean War it did not see action, although it flew over Lebanon and Quemoy in 1958. With the more powerful engine, the aircraft was a delight to fly, though still rather short-legged. Undoubtedly spurred on by the huge success of the short runGrand Phoenix kit, Hobby Boss now has produced this very nicely done mainstream injected plastic kit of the somewhat ill-fated predecessor to the phabulous Phantom II. If you have built a Hobby Boss kit as of late, you will know how nicely done the detailing is on their kits. All the panel lines are recessed and there are recessed areas everywhere that there are screws on the real aircraft. Modern jets often have a considerable number of removable access panels so these are quite within the norm. There is also rivet detail on the wings and tail planes. I know that some do not like this, but most of us do not mind them. The cockpit is very nicely detailed with a good looking ejection seat, though no harness. The instruments are raised and you have decals that you can place over them if you do not wish to paint them. Detailed sidewalls are also provided. I'm sure that someone will do a bunch of resin for this in the near future, but most will be pleased with what comes in the kit. The thing about the Demon is that it does not do well with standard contraction. Like the Grand Phoenix kit, you get the cockpit section that extends back around which the intakes and the rest of the fuselage is placed. There are also a considerable number of inserts for the guns, speed brake wells, hook well, gear wells and other bits. It is just the nature of the beast and means that the builder will have to pay attention to what is going on. 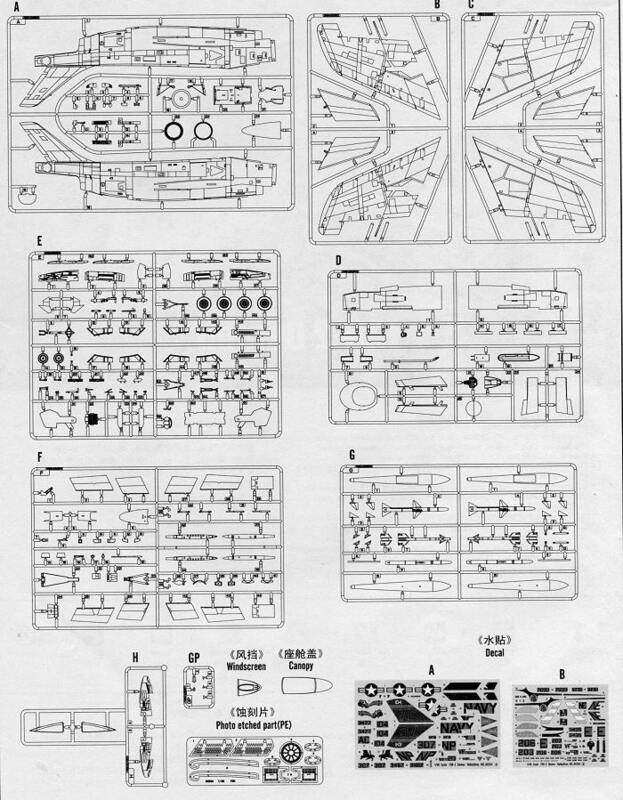 If one has built the Grand Phoenix kit, there will be a bit of deja vu as it is arranged pretty much the same. The kit does come with a photo etch fret that includes speed brakes, wing spoilers, a bunch of wing fences and a burner can. Options are open or closed speed brakes, open or closed canopy, and the ability to fold the wings. To do the latter, the builder will need to scribe along a recess on the inside of the wing to separate them. Once that is done, then w ing rib detail pieces are inserted and into those will go small hinges. It is all quite straight-forward and a nice option to have on what is a rather large aircraft. There are things for the undersi de that include fuel tanks, Sparrow and Sidewinder missiles. Basically it is (from the fuselage out) tanks, Sparrow, Sidewinder. 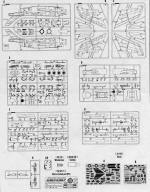 Instructions have 17 well drawn construction steps with Gunze color references. 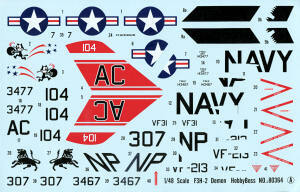 The superbly printed decal sheet offers markings for four planes. One is the box art aircraft of VF-31. 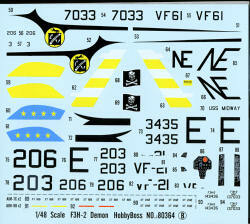 You will also find markings for VF-213, VF-21 and VF-61 (which had the Jolly Rogers banner at the time). To my eye, the yellow for the VF-21 option is too light, but this may darken up when applied. If these are not enough for you, there have been aftermarket sheets produced for the earlier kit that should fit and can be found with some effort. If you missed out on the Grand Phoenix kit, or tossed it in a fit of pique or just want more Demons on the shelf, then this is it. It is reasonably priced for what you get and makes into a quite large model.